Enduring the teasing and ridicule of her school mates, Sadie struggles through life as a pre-teen on the eve of her 13th birthday. Three years ago, a car crash took her mother, but Sadie never saw her body. She refuses to believe her mother is really gone. Holding fast to that feeling earns her the nickname "Crazy Sadie." Despite her one wish to be normal, Sadie only finds solace with a small group of unusual characters. These unlikely friends give her a "semi-normal" life outside of school in a bookstore where strange and mystical things seem to happen. In fact, if Sadie entertains her deepest suspicions, her friends are a little mystical. 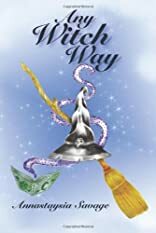 When her birthday arrives however, Sadie finds herself whisked into a magical world that swirls just under the surface of normal, everyday life. Not only does she learn she'll soon become a witch, but she also discovers she must battle The Syndicate to save her new world. Faced with fantastical encounters, unexplainable transformations, and startling fears, Sadie struggles against an unknown evil - all while searching for her real identity. About Annastaysia Savage (Author) : Annastaysia Savage is a published author of young adult books. A published credit of Annastaysia Savage is Any Witch Way.